The Strum Shop’s repair staff is well-trained and experienced with all manners of stringed instrument repair, customization and restoration. The quality and care of our instrument repairs are one of the main things that separates us from other instrument repair shops. You can assure your repairs will be carried out as if they were our very own instruments. 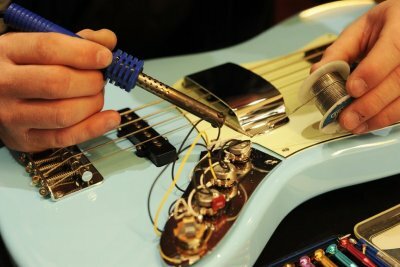 We Do it All - Services include, but are not limited to: adjustments, set-ups, crack repairs, bridge repair, hole patching, restringing, fret replacement and leveling, pick-up installation, etc. for a wide variety of instruments such as: guitar, ukulele, banjo, mandolin, dulcimer, bass and so much more. For exact quotes on repairs, please bring your instruments into the shop. Band & Orchestra Instrument Repairs are provided by TAUGE Band Instrument Services. Instruments for repair by TAUGE may be dropped off & picked up here at The Strum Shop during shop hours. TAGUE Band Instrument Services is a full line service shop offering repairs of all band and orchestral instruments as well as percussion repair. We service everything from entry level instruments to professional state-of-the-art instruments and offer services ranging from routine maintenance to custom fabrication, modification and complete mechanical restorations. We also offer ultrasonic cleaning for brass instruments and non-wood woodwind instruments. This ultrasonic technology is an innovative method of cleaning brass and non-wood musical instruments by using high frequency sound waves and a biodegradable, environmentally friendly cleaning solution. Non-wood refers to clarinets, oboes or bassoons that are made of either plastic, ABS or composite materials. I choose not to put wooden instruments in the ultrasonic cleaner. However, the keys of these instruments clean-up very well in the ultrasonic cleaner. Transducers mounted to the tank walls create tiny bubbles which upon bursting, create a capillary scrubbing action to both the outside as well as the inside of the instrument. This action penetrates the instrument as long as the cleaning solution is filling the instrument. This state-of-the-art cleaning is the most thorough cleaning available. Dave Cavanagh has been doing stringed instrument repairs since 1969. Dave also owned a music store (Cole Music Co. in Sonora CA) from 1980 until he retired in 1990. Dave is honest to a fault and extremely well versed in all forms of stringed instrument repair. 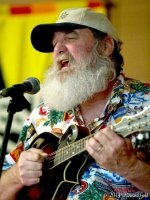 He still performs regularly on 5 string banjo, mandolin, fiddle and guitar. Plays well with others, but has been known to run with scissors. "I guarantee all my work. If you ever have a problem with any repair, I promise to take care of it!" 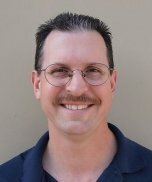 Kris has been a member of the National Association of Professional Band Instrument Repair Technicians (NAPBIRT) since 1993. NAPBIRT is the international organization devoted to the continuing education and training of musical instrument repair technicians. Kris has been responsible for the highest quality of repairs provided in the Citrus Height area for over 20 years and continues this tradition with his new business venture at his shop in Citrus Heights.